Video clip synopsis – In the late 19th century, art literally took to the streets as Paris was flooded with eye-catching posters, made possible by the invention of lithography. Broadband MP4 hidden9_bb.mp4 (17.4MB), suitable for iPods and computer downloads. Poster Mania is an episode of the series Hidden Treasures (15 × 5 mins) produced in 2006. In the late 19th century, art left the galleries and drawing rooms of the wealthy and literally took to the streets. Paris was flooded with bright, eye-catching posters, made possible by the invention of lithography—a printing process that allowed coloured images to be mass-produced. One of the most prominent French artists to use this new technique was Toulouse-Lautrec, the only son of one of the most ancient and noble families in France. He was severely crippled by a genetic malformation of the bones—the result of aristocratic inbreeding. To the horror of his father, the proud family name was now being bandied about the streets of Paris. As a compromise, Toulouse-Lautrec developed a monogram of his initials. His Jane Avril poster, in the National Gallery of Australia’s collection, is a classic—an eloquent comment on the hard, sometimes tragic lives of Parisienne entertainers, but also touched with humour. Liberation for women was in the air at the turn of the 20th century: in Clémentine-Hélène Dufau’s advertisement for a feminist journal The Sling shows a bourgeois woman pointing a less advantaged 'sister’ towards the Sorbonne University; in Henri Thiret’s advertisement for the new craze of bicycle riding among young women; or, now that it was chic for fashionable young women to smoke, in an ad for Job cigarette papers. The Street by Theophile-Alexandre Steinlen’s for poster maker Charles Vernet shows the people that the new poster targeted: a milliner, businessman, laundrymaid, nurserymaid and governess with her charge. It’s in pristine condition, having never been used as a poster, and a detailed study reveals the process used to make such large, multi-coloured prints over and over again. Lithography and the poster mania of the 1890s gave artists an exciting new avenue for artistic expression—a way to get their art seen by ordinary people. Then, posters were often souvenired almost as soon as they were pasted up. Now, they’re highly valued collectors’ items. By 1890, the official Salon—the organiser of state-sponsored exhibitions in France since 1667—had become an outmoded institution, unreceptive to the work of avant-garde artists. Research and discuss how these avant-garde artists attempted to gain access to a wider audience. 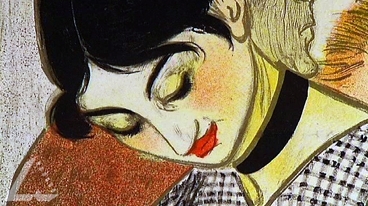 Examine the lithographs and posters of Henri de Toulouse-Lautrec and other artists from the 20th century, then discuss the ways in which they present visual signs of persuasion and protest. Some examples may be poster imagery used as a means to criticise injustice and inequities, or to improve the quality of life, to glorify revolution, or even to define the artist’s own reality. Write and illustrate a research project on the life and artworks of Toulouse-Lautrec in the 1890s Paris art movement. Use the style of Toulouse-Lautrec to design posters for any school event. Any appropriate art media and computer graphics software may be used. Discuss in class current local, Australian and world events or social problems that concern you, then choose one of these issues to research and present in an artwork. You should write about how you feel towards the situation, and formulate visual solutions to the problem before starting your design for a poster. Any medium may be used, or techniques of printing lithographs may be explored.